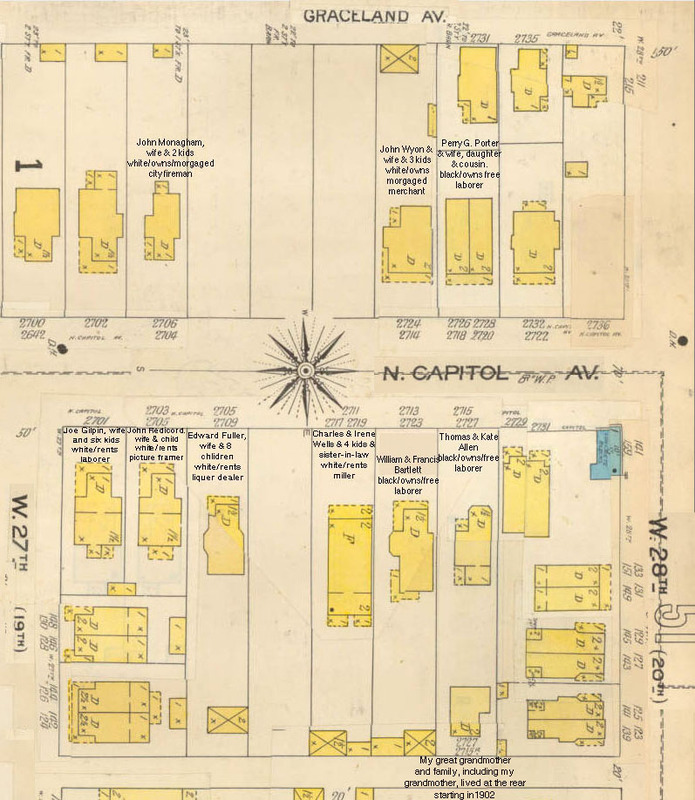 After spending half the day wondering around among Joseph Sharp Yowell’s records and family members, I decided I would not even try to just write up his story. This will be the story of how I researched just about everybody that appeared in this year’s A to Z Challenge. I found his name when I was looking through Thomas Ray Allen’s pension file for names to use in this challenge. “Yowell” was perfect for “Y”. Then I copied all the pages with his name. I am not using all of them in this post because some just have his name and there are others with more information. This is my favorite piece from the pension file that mentions him, because it gives the names of the three witnesses that served in the same company with Thomas, even though half of it is missing. Next I set up a tree for Joseph Yowell on Ancestry.com. I did this for all the people that I wrote about during this A to Z Challenge. That way, I find and save their records. Below is a chart with various records I found for Joseph Yowell and how they relate to each other. I found all of these records on Ancestry.com Click to enlarge so you can read it. 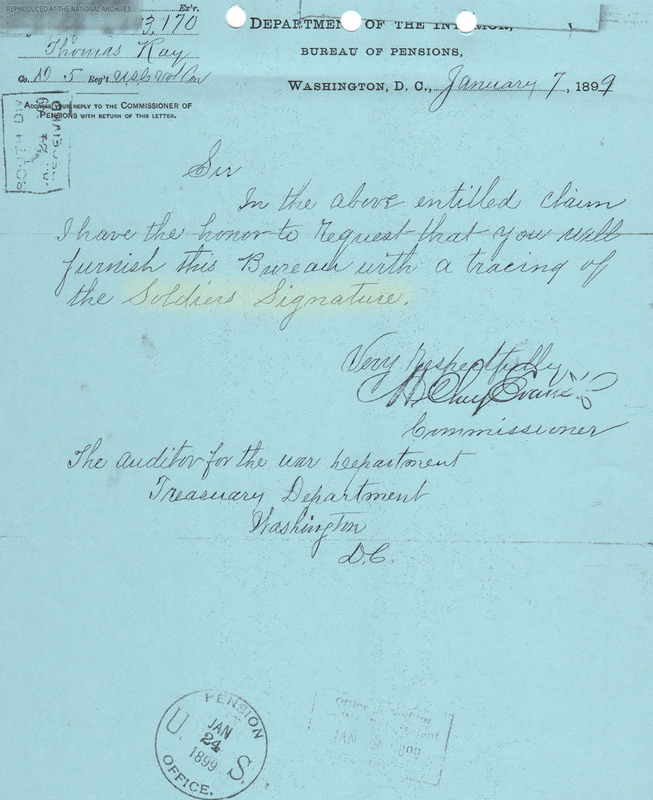 1. on the left, is a record from the U.S. National Homes for Disabled Volunteer Soldiers, 1866-1938. On the top right of the form they list his closest relatives. First is his brother Fletcher Sharp who lived in Lebanon, KY. 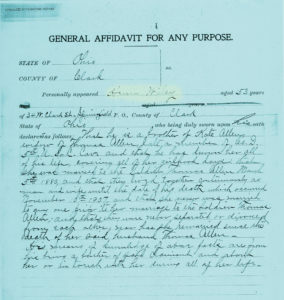 The second is his cousin Mollie Bates who lived in Indianapolis. At the bottom of the form they mention his widow, Diana Sharp, who ordered his grave stone. She lived in Lebanon, Kentucky. 2. 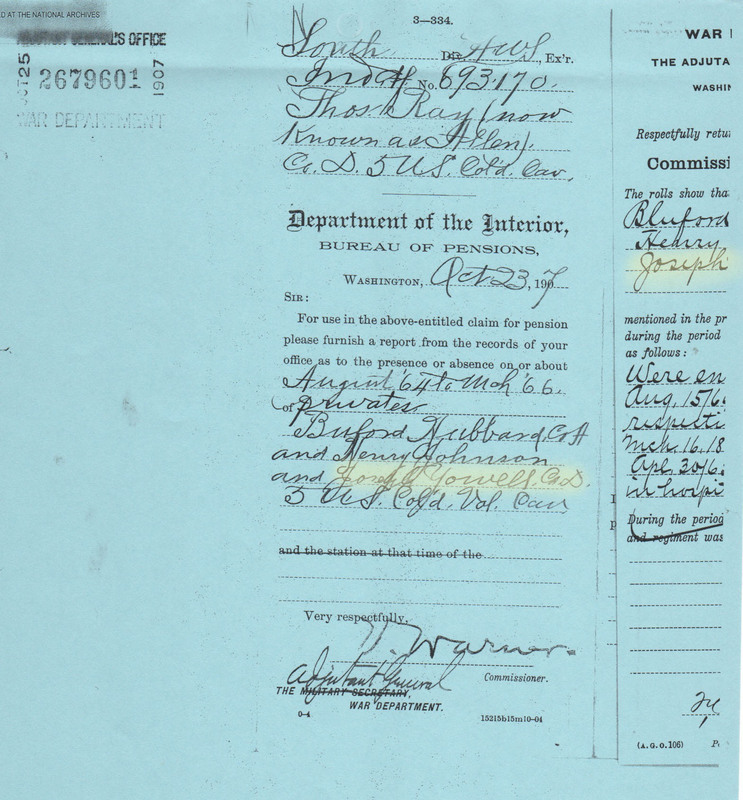 The pension card says that Joseph Yowell also used the name Joseph Sharp. It also has his widow’s name, Diana Sharp. 3. 1880 Census, Lebanon Kentucky. When I found a Joe Sharp in the 1880 census, I was not sure if it was my Joe (Yowell) Sharp. When I saw that he was living with Fletcher Sharp and his family and was listed as Joe Sharp, brother, I knew I had found the right Joe Sharp. 4. 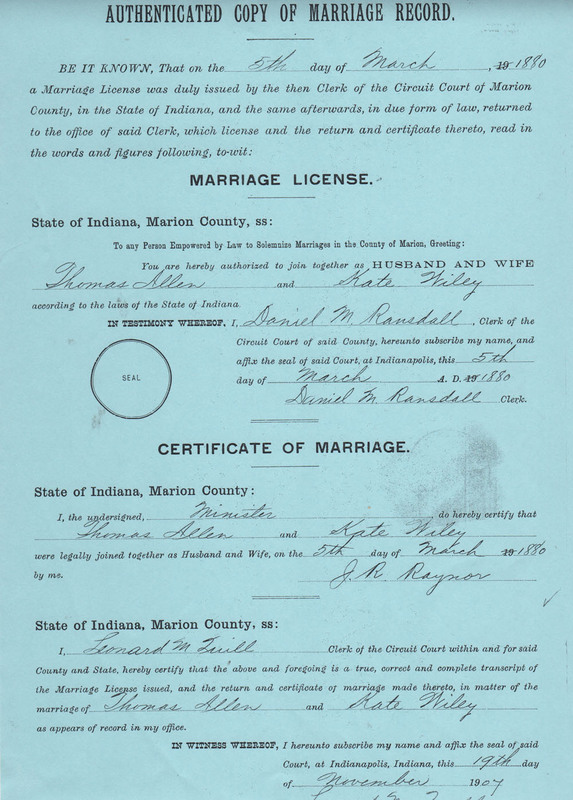 Marriage record of Diana Abell and Joe Sharp. Diana was named as his widow in the first document. 5. 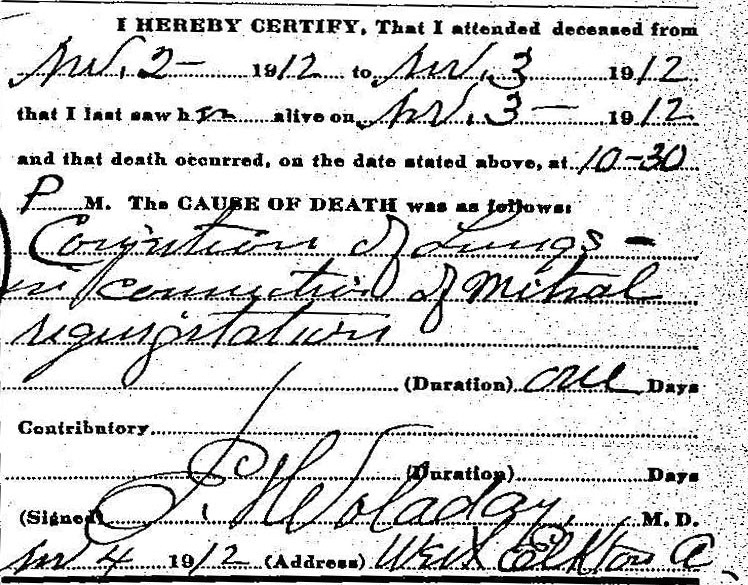 Death Certificate. In addition to telling us what he died of, it gives his parent’s first names. His father’s name was Major. 6. I followed Joseph’s brother Fletcher around in the records for awhile, then I looked at his wives. He was married twice. First to Ann and second to Nancy, both with the surname of Miller. I wondered if they were sisters, so I followed them around. I found Nancie Miller in the 1870 census living as a house servant in the large household of a white couple, William and Minnie Sharp. Also living there was 80 year old Major Sharp, probably Joseph Yowell’s father. I did find his cousin Mollie living with her husband in Indianapolis but did not find Joseph living with them. 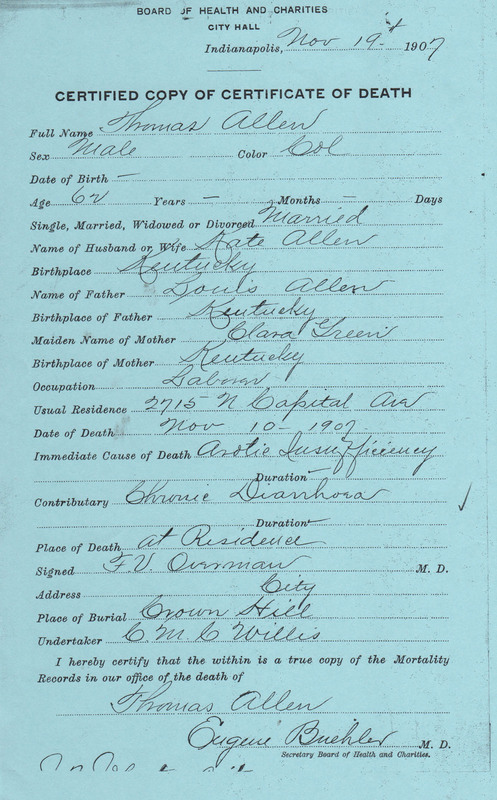 I did find her family a few pages away from the Sharps in one of the census records from Kentucky. I never found Joseph Yowell and Diana living together. He was listed as “single” in several records and as married or widowed in others, even though she survived him. Joseph Sharp Yowell’s name – his father was Major Sharp and his owner during slave days was John Yowell. 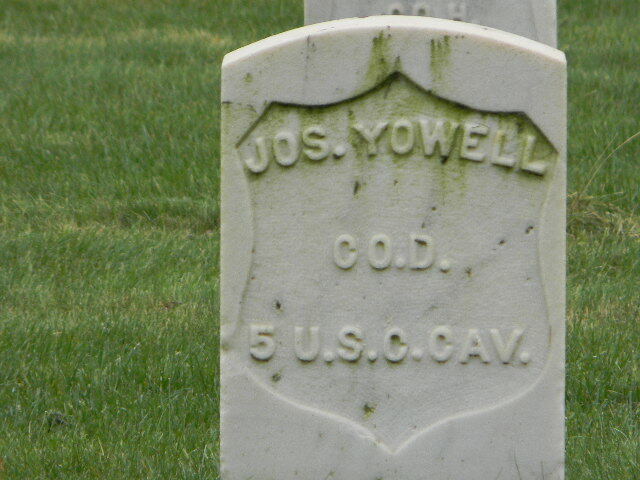 This name appeared on his military records, however I was unable to find a John Yowell who owned slaves in 1850 or 1860 in Taylor or Marion county. 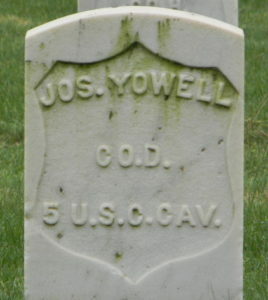 Joseph Yowell appeared in the Indianapolis as “Joseph Yowell” in 1899. 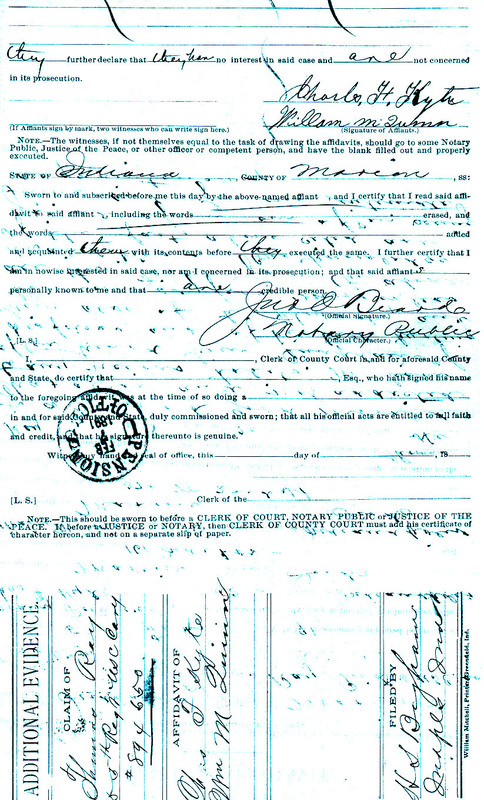 In the 1900 Census he appeared as Joseph Sharp. 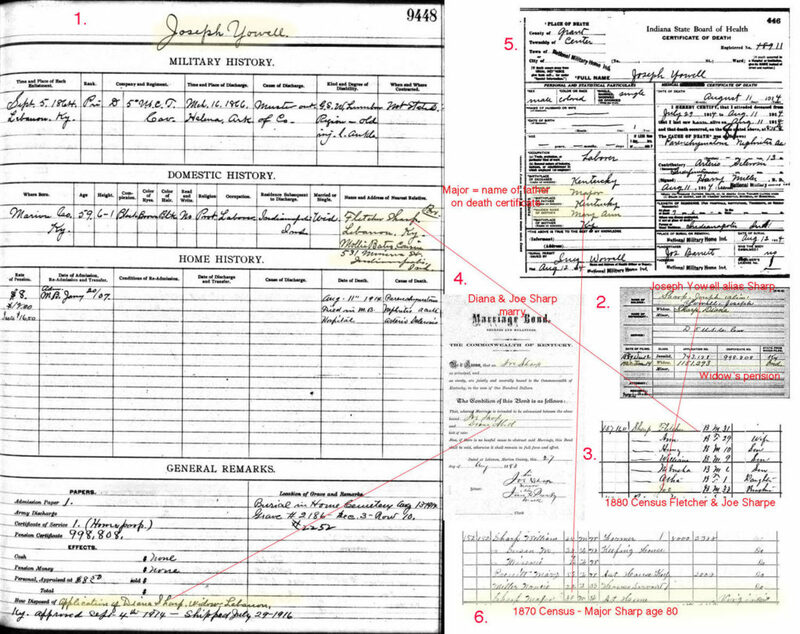 In 1910 he was in the Soldier’s Home and was Joseph Yowell in that census and in the records that he generated there. 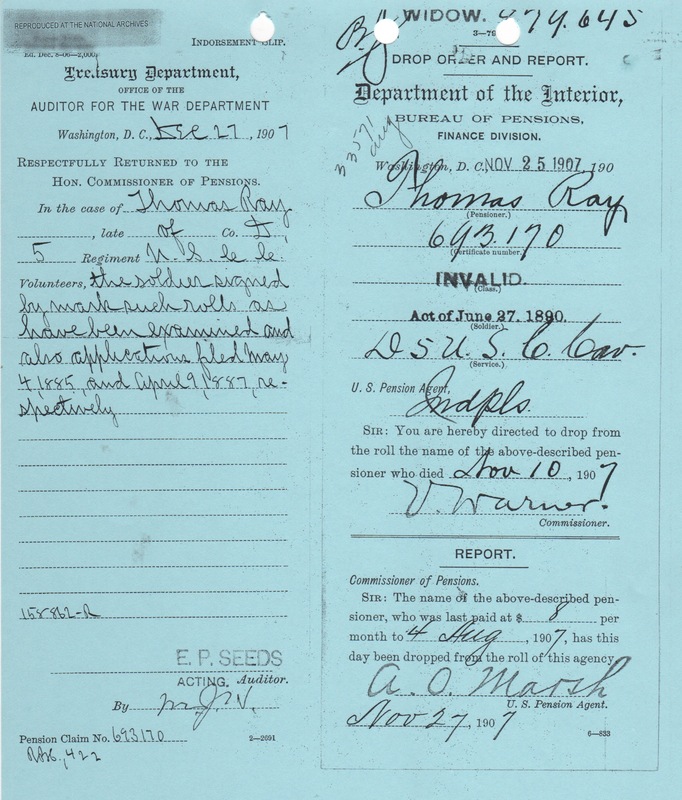 When Thomas Ray Allen joined the military in 1864, he was unable to sign his name. I wonder how he learned to read and write. Did he attend classes? Did his wife, who had attended school as a child teach him? Either way, I was very glad when I first received his file and saw that he could sign his name. Henry Wiley, younger brother of Kate Wiley, was born free in 1855 to Woody and Sarah Wiley. Soon after he was born, the family moved from Virginia to Athens Ohio. He was the middle child. Henry attended school along with his brothers and sisters and learned to read and write. When his father Woody, died in 1873, Henry was 18. His father asked him to make sure that all his just debts were paid, he thought they could be paid by the sale of his horse and wagon, but if not Henry should pay them and get reimbursed from the sale of the land. He was left one of the beds and bedding, with the remainder of the household goods going to his sister Sarah. He also appointed Henry as executor and stated that the property be divided between three of his children, Henry, Sarah and Armintha, when Armintha came of age. !n 1884, at the age of 29, Henry married 23 year old Polly Fish. 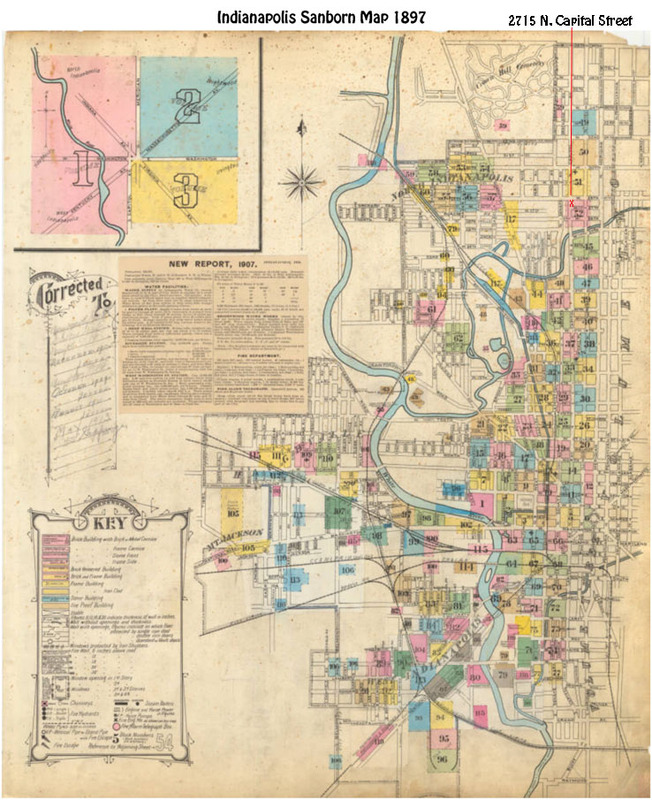 They lived in Springfield, Ohio where they owned their own home free from mortgage. Henry was a brick mason, an occupation he followed for the rest of his life. Polly kept house. They had only one child, a daughter, Glenna Belle, born in 1885. Sadly, Glenna Belle died when she was just six years old. 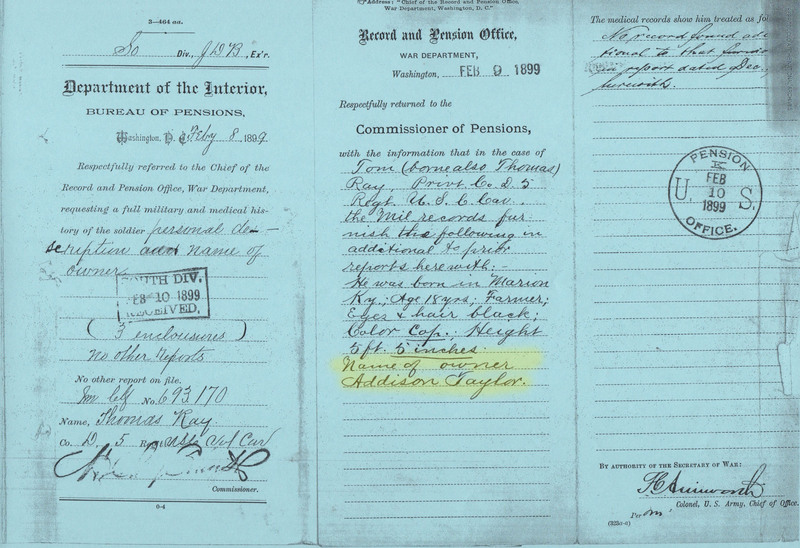 He testified for her when she was applying for her widow’s pension on February 4, 1908. In 1912 Polly was 60 miles from home in West Elkton, Preble, Ohio visiting her eldest brother James and his family, when she died. She had been there for two days. Cause of death was congestion of lungs with ??? mitral regurgitation. She was 50 years old. Her niece Janey was the informant. Two years later Henry married Martha Johnson Edwards, a widow with six children. The children were pretty much grown by the time of the marriage with only two remaining at home by 1920, a 20 year old daughter who worked as a servant and a 16 year old boy who wasn’t in school or working. 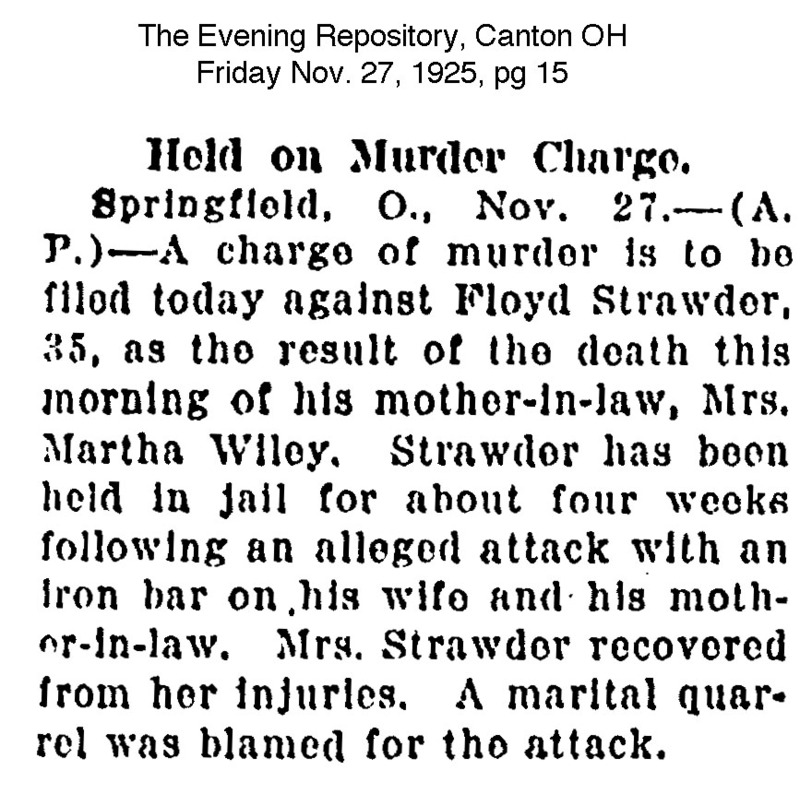 Tragedy struck again in November 1925 when Martha’s son-in-law, Floyd Strawder hit her over the head with an iron bar and killed her. Her skull had been fractured. I expected to find him in prison in 1930, but he was living as a divorced (no surprise there) cement worker in a boarding house. In 1933, Henry Wiley died at his residence of a heart attack, influenza being a contributory factor. Mrs. Will Jones was the informant and she did not have much information about him. 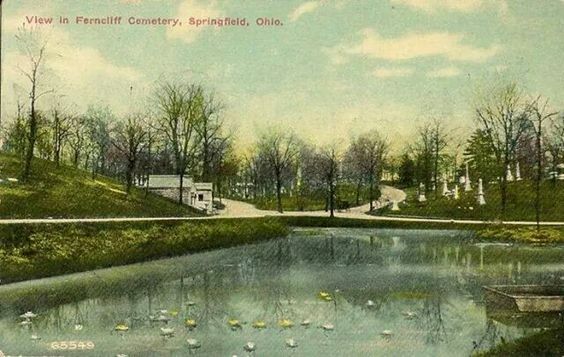 He was 78 years old and was buried in Ferncliff Cemetery and Arboretum in Springfield Ohio, a 240 acre combined arboretum and cemetery. From the Ferncliff pinterest page. As I went through Thomas Ray Allen’s pension file, I wondered why it was so difficult for him to get his pension raised when his medical reports showed how debilitated he was. There were those who thought that many of the veterans were not really in need of their pension money, that it was a drain on the Federal coffers. I have shared some quotes below with some of the hows and whys of this state of affairs. 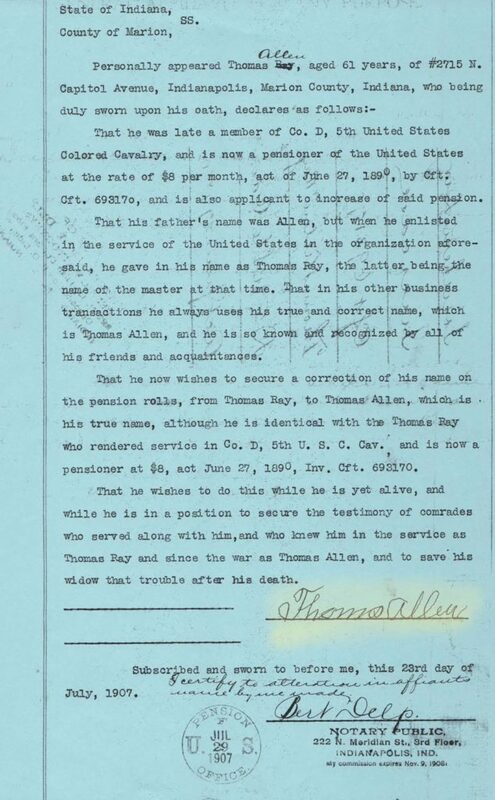 After reading about Arthur Bull, another Civil War Veteran trying to get his pension, on the blog Molly’s Canopy, I realized that Thomas was fortunate in not having to travel long distances to a doctor as some of the rural veterans did. 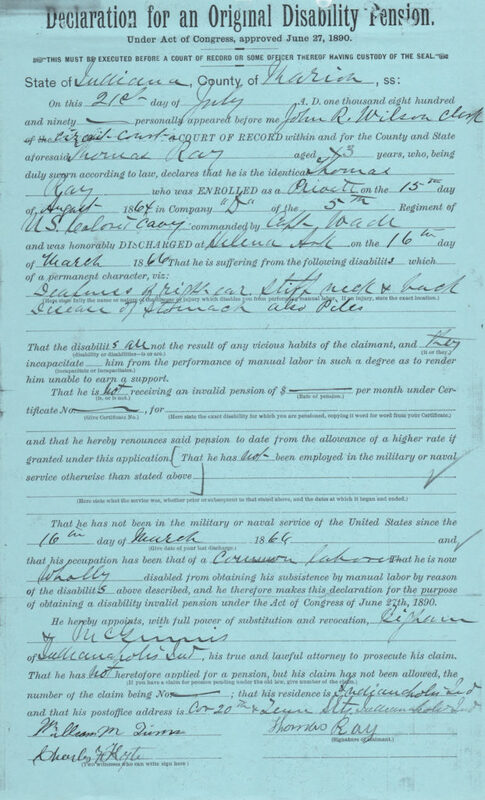 Thomas starts the process of receiving an Invalid pension a month after The Dependent and Disability Pension Act passed and was signed on June 27, 1890. Public opinion eventually formed against the pensioner, believing that many were trying to scam the government out of money they didn’t deserve. 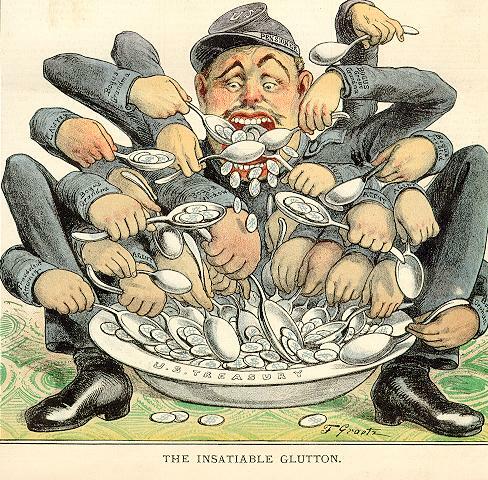 Cartoon from the the Social Security History page about the pensions. Click the photo to go to the page. 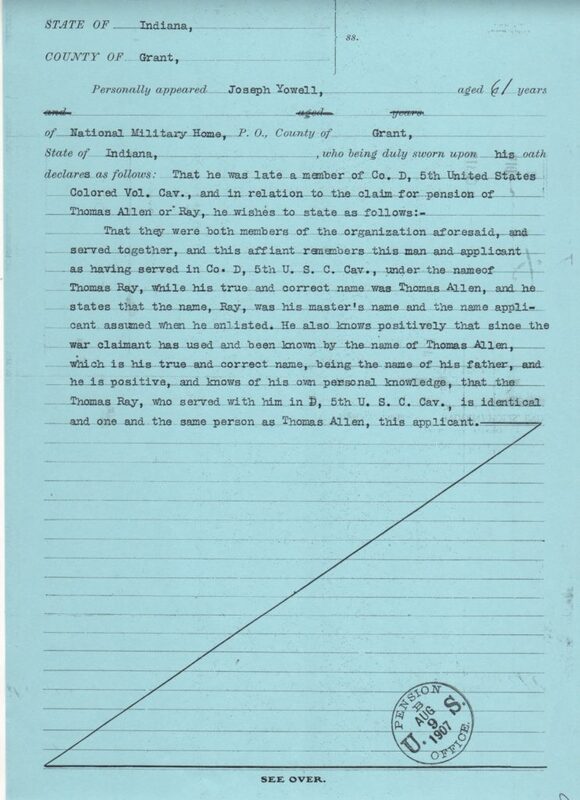 Thomas Ray Allen trained at Camp Nelson and must have witnessed and experienced what is described here. Click to see the video that goes with this audio clip and the excert below – Camp Nelson Heritage Park. “Eight U.S. colored regiments, as they were called during that time were founded here and three others were trained here. So roughly ten thousand African American men became soldiers at Camp Nelson. In 1864 and 1865. The significance of those recruitments, first of all, was that it was the beginning of the end of slavery in Kentucky. Second of all, these men made a significant contribution to the union victory in the Civil War. A number of regiments were involved in large and small engagements. A number of soldiers were stationed at critical transportation nodes where they protected garrisons, they protected bridges, they protected supply depots. 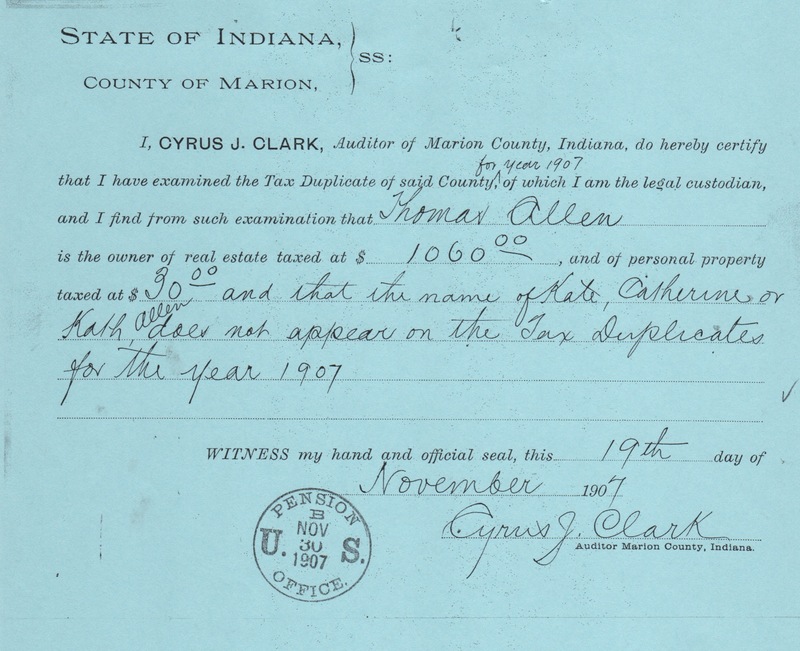 William Quinn was 36 when he testified for Thomas Ray Allen at the beginning of the pension process, when he was just trying to get his pension. This testimony was given in 1891. The pensions were instituted in 1890. This General Affidavit was “For the testimony of EMPLOYERS OR NEAR NEIGHBORS of the soldier, (other than relatives) who have known him before his enlistment or since his discharge and return from the army.” Quinn testified that he had known Thomas Ray Allen for twenty years. 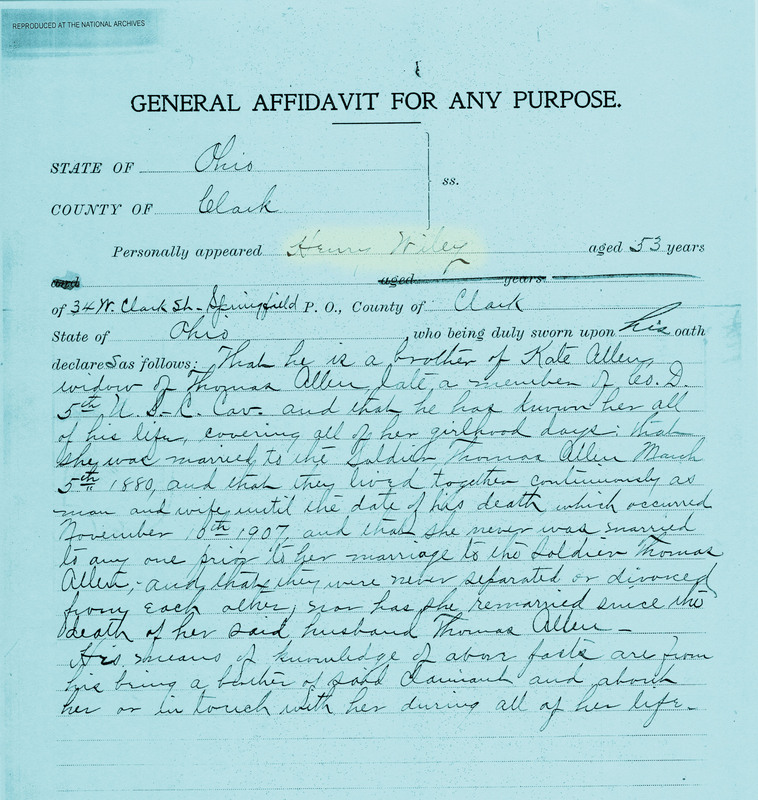 William Quinn was born into slavery about 1854 in Hodgenville, Larue County, Kentucky to Simon and Phoebe Quinn. He was the oldest of seven children. Thomas Ray Allen’s first wife was also born in Larue County. 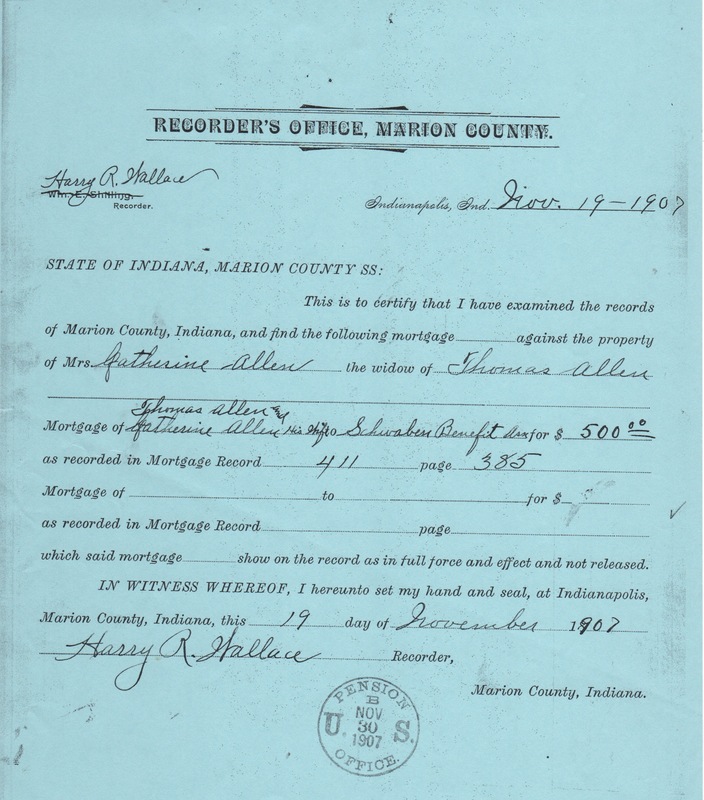 Twenty-two year old Quinn married Julia Ann Cole in their home county on May 31, 1876. She was eighteen. 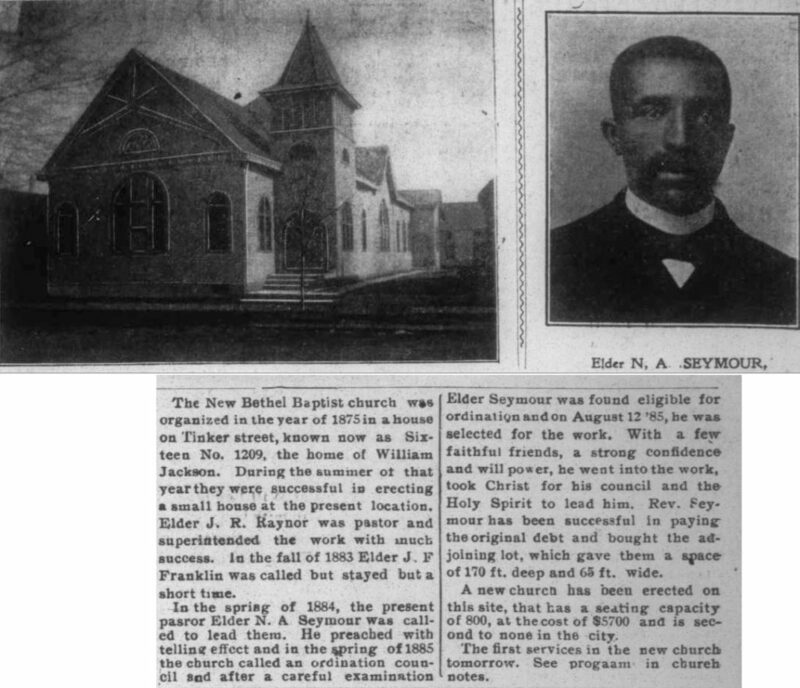 By 1880 he was in Indianapolis, Indiana working at a barber shop. Julia was not with him. Probably she was waiting back in Kentucky for him to get settled. By 1900 they had been married 24 years. There had been no children. Quinn was a barber. Julia did not work outside of the home, however they had seven lodgers so she had plenty of work. All of the lodgers were born in Kentucky, except for the wife of one who had been born in New York. Everybody was literate. William Quinn continued to barber, eventually having his own shop. Julia continued to have a house full of borders until 1940 when they were living in an apartment and neither was working. They did have another, unnamed, source of income. Perhaps they were renting out the barbershop and the boarding house. Or maybe they sold them. Quinn had never attended school while Julia had attended for three years. That makes it all the more impressive that they were both literate and that he was able to sign his name so well when giving his testimony. The words on the back of this sheet showed through in a distracting way. I used photoshop to try and make it easier to read, hence the difference in color from other sheets in the file. Julia Ann Quinn died of an intestinal obstruction at home in their apartment, on February 8, 1943. She was 83 years old. Her husband was the informant. A little over a year later, on April 25, 1944, William Quinn died of hemiplegia, which means that half of his body was paralyzed due to a stroke. He died at home in the old boarding house. He was listed as 87 but if the earlier dates of his birth are correct, he was closer to 90. Thomas Quinn, his younger brother, was the informant. Thomas lived in Illinois so perhaps came down to be with his older brother while he was ill, or maybe he hoped to persuade him to move to Chicago and live with him. William and Julia are buried side by side in Crown Hill Cemetery in Indianapolis. 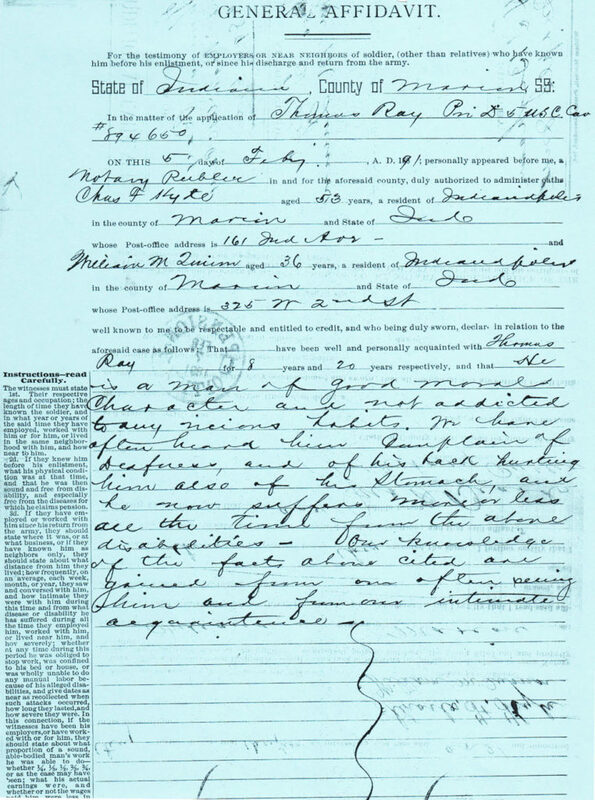 I found this information on ancestry.com, familysearch.org, Thomas Ray Allen’s Pension File (It is about 1/2 an inch thick when I squeeze it together, over 100 pages.). I also used google to find out about hemiplegia.